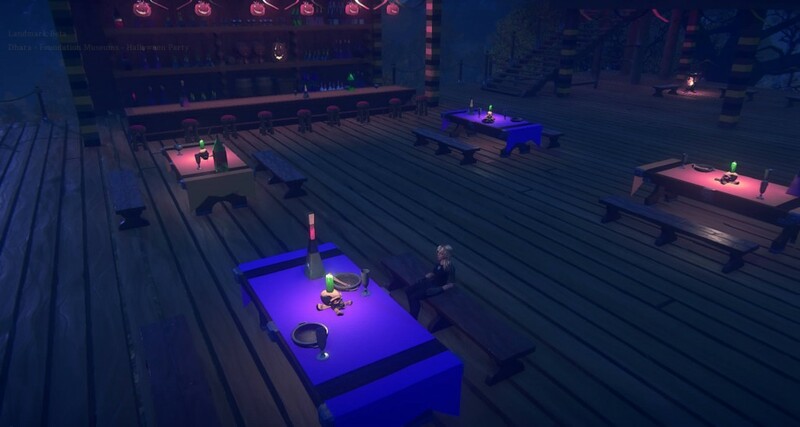 Halloween is our favorite holiday and with the new Halloween Party Island, we just knew we had to plan an event! The Haunted Mine Maze consists of an underground maze, a party area where you can keep an eye on players progress through the maze, along with a full open bar. 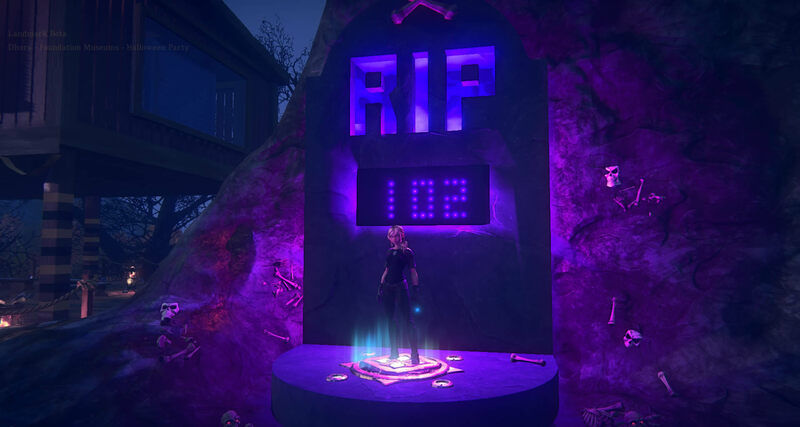 If running mazes just isn’t your thing (or maybe the queue line is just too long) please feel free to visit the Old Miner’s Graveyard outside for some fun with Trick & Treats! Event is planned to last at least 1 hour and depending on interest, we may choose to go longer up to a maximum of 3 hours. After that the maze will remain open for continued Halloween fun! It will remain open as long as the island is online, or until we need to use our claims for another endeavor, which ever comes first. One player in the maze at a time. Wait at the gate and when the green light is on you may enter. The timer starts when a player first enters from the queue line. Pull the lever to shut the door behind you. The timer ends when player appears at the ending gate. Upon finishing your run, pull the lever to open the exit gate. Please check that either Dhara or FryCaptain have recorded your name and time before you leave. We will be on the premises for the entire event. Dhara will be wandering around tending to guests and various tasks and FryCaptain should be in the Control Booth most of the time. Finally, please do not use your grappling hook during the event. Maze Timer: Displays a player’s current time. Time to Beat: Displays the best time of the night. 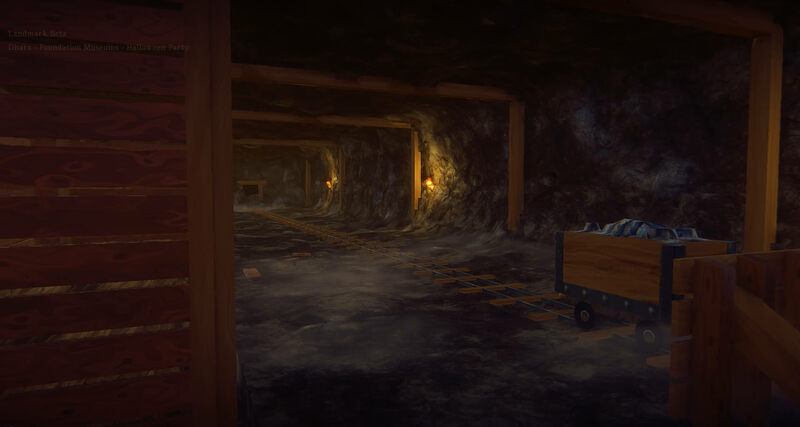 Players must complete the maze by 9 minutes and 59 seconds. 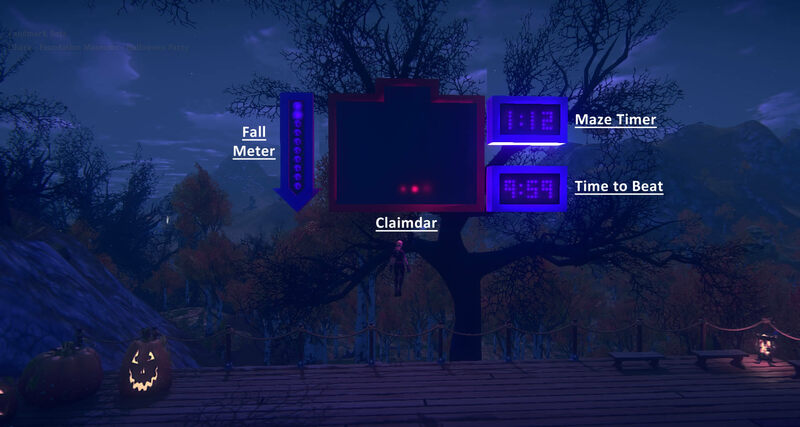 Claimdar: Displays the current position of the player in the maze. Fall Meter: Displays the downward decent of unfortunate players (or guests). The three players with the lowest times will each get one $10 Daybreak Cash code. Winning codes will be sent via in-game email by default at the end of the event. If you prefer delivery via email, or another method, please give those details to Dhara or FryCaptain. We would like to thank Emily and the Community Team at Daybreak for donating these prizes! 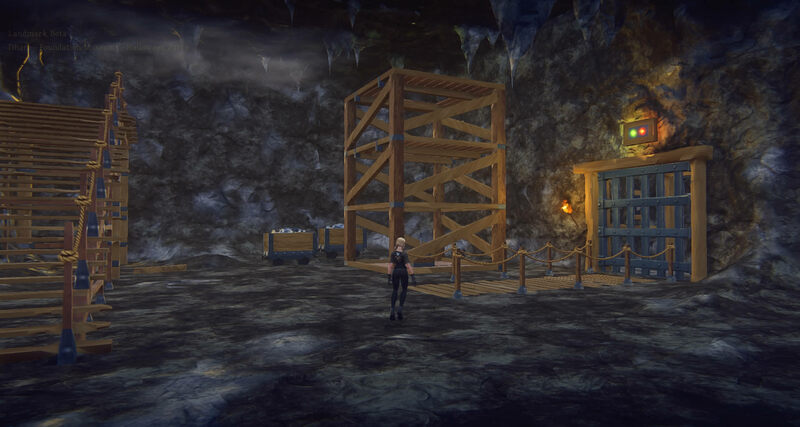 This maze and the displays use a fair amount of linking and triggering elements. Some players with lower-end systems might show a decrease in FPS. We have done our best to optimize these elements to ensure that most players should be able to run the maze just fine, however, we can’t guarantee that any one player will be able to play comfortably or encounter quirks due to the wide variety of systems available. The timer Fry created is only 99% perfect. Some slight variances may (or may not) occur. 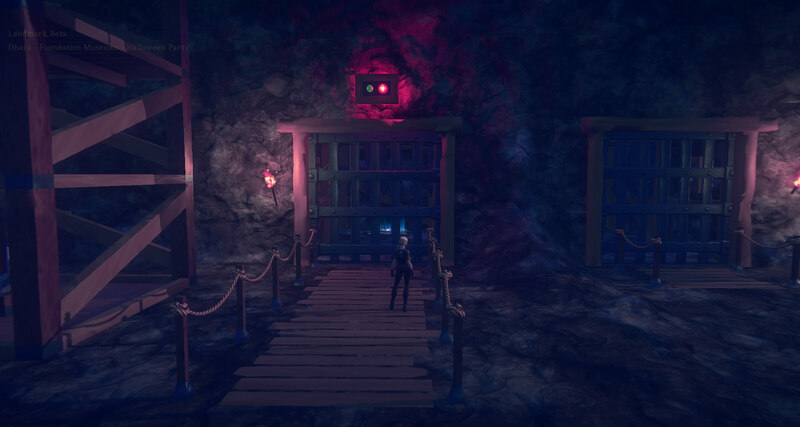 As you know, this game is in beta and we are still on our first iteration of the linking and triggering elements. Our testing thus far has shown that these variances are minimal, however if you believe that your time is way off base, just let us know and we will might be able to view one of the streams to verify. In some instances a consolation prize could be awarded at the discretion of either Dhara or FryCaptain. Enter at your own risk. We take no responsibility for any injuries or deaths!